Hello, today we prepare blue style with three different templates for your fashionable flip book. They are all free for you. Do you like blue color? 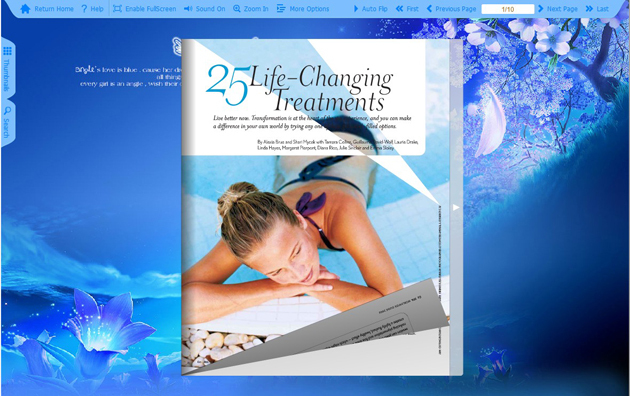 Would you like to own blue templates to decorate your digital magazine? Do you want to design outstanding output appearance of your amazing digital book in few seconds? Do you need to show your digital versions with sensibility to catch people s heart? Here, you can make them all come true. There are seven main colors in our world, but at the same time, we would have thousands of colors and have kinds of blue colors. In some extent, blue represents ocean which is very pure, so someone has said that blue would show people s generosity and pursuit for harmony society. Meanwhile, someone has said that it s also cold color and it would show the one who is gloomy. In total, people would like to choose blue to build their corporate image, for example, computer, car, printer, photography and so on. Different culture has different knowledge for blue, but the total effect is that it would easily to make people to think ocean, water, sky which would make people feel good and peaceful. Get these blue style templates now. Flash Flip Book Theme of Blue is an utility that works under windows xp, windows vista and windows 7. It supports both 32-bit & 64-bit windows editions, therefore it could run faster on 64-bit computers. It is Free so you can download it and share it with your friends. Estimated download time for Flash Flip Book Theme of Blue on a common adsl connection is less than a minute. Version 1.0 was released two thousand five hundred fifty five days ago by FlipPDF.com. Click the green download button to download it now.